Urban boosters are rightly proud of the progress American cities have made since their nadir in the 1970s; Harvard economist Ed Glaeser has gone so far as to proclaim “the triumph of the city.” Yet recent events — notably Detroit’s bankruptcy and the victory of left-wing populist Bill de Blasio in the Democratic primary of the New York mayoral election — suggest that the urban future may prove far more problematic than commonly acknowledged. Detroit’s bankruptcy revealed the unsustainable fiscal problems facing most major urban centers, including, most importantly, President Obama’s political base of Chicago. This summer, Moody’s downgraded the Windy City’s credit rating three notches, noting the unsustainable nature of its pension obligations. Some 37 cities have filed for bankruptcy since 2010, most of them small, and as many as 20 others may be on the verge, including larger places like the California cities of Oakland and Fresno, and Providence, R.I.
My hometown of Los Angeles may not be far behind. Perhaps the most union-dominated big city in America, the City of Angels’ pension obligations have gone from 3% of the city budget a decade ago to 18% last year. They are rising at a phenomenal 25% annual rate, according to a recent report by an independent watchdog, California Common Sense. Given this background, the political tides in New York suggest a worsening of the crisis. Thanks to the Bernanke-inspired Wall Street boom, the New York economy has not suffered the extreme fiscal distress of other big cities. But its fiscal condition is far worse than Mayor Michael Bloomberg and his well-oiled media machine might suggest. Under Bloomberg city spending grew 55% while pension costs have grown 300%. With de Blasio likely to be the next mayor, we can expect the bleeding to get worse. Many business people rightly fear a de Blasio’s administration will raise taxes in order to meet public employee demands. Faced with financial shortfalls, de Blasio’s response, notes historian Fred Siegel, is likely to be similar to that of his hero, former Mayor David Dinkins, who consistently gave in to public unions and raises taxes. But it’s not enough to dismiss de Blasio as a throwback. His victory reveals the depth of a profound social crisis beneath the glitz and glitter of Bloomberg’s luxury city. Similar class and geographic divisions can be seen throughout the country but inequality seems most egregious in New York. A recent analysis of inequality by University of Washington demographer Richard Morrill found New York to be the least egalitarian big metro area in America. This is borne out by other research: the New York City comptroller’s office found that the top 1% account for roughly a third of Gotham’s income, twice as high a share as in the rest of the country. Incomes have surged on Wall Street but most New Yorkers — two-thirds of whom are racial minorities — have struggled to keep pace. Controlling for cost, in fact, the New Yorker’s average paycheck is among the lowest among the nation’s 51 largest metro areas. Nearly half the city’s residents, notes theNation, are either below the poverty line or just above it. Bloomberg’s policy focus on ultra-dense development geared to Wall Street, the global rich, and the needs of the all-powerful, largely Manhattan real estate community has done very little for the vast majority of New Yorkers. This reality has lent credibility to de Blasio’s “tale of two cities ” stump speech and the growing rejection of Bloomberg’s legacy. Not that all of this can be laid at Bloomberg’s feet. New York’s economy has been changing for decades. New York of the 1950s was a manufacturing, trade and fashion superpower, employing hundreds of thousands of middle- and working-class residents. Large corporations employed large numbers of white- and pink-collar workers. This made New York, although always with its extremes, still a very middle- and working-class city. New York’s blue-collar economy has withered to a degree unmatched in most other U.S. cities. The port, the city’s original raison d’etre , lost its primacy to Los Angeles-Long Beach by 1980 and now ranks third in cargo value behind Houston-Galveston as well. The manufacturing sector, which employed a million in 1950, has shriveled to 73,000 jobs today (note that a small part of the decline is due to the BLS’ reclassification of some jobs to other sectors, and other statistical changes). Manufacturing employment in NYC has shrunk 39% since 2004, the worst performance of any major metropolitan area. A similar, albeit less dramatic decline has occurred in white-collar employment, in part due to the movement of large companies out of the city. In 1960 New York City boasted one out of every four Fortune 500 firms; today there are 46. And even among those keeping their headquarters in Gotham, many have shipped most of their back office operations elsewhere. Employment has even dropped in the “booming” financial sector, down 7.4% since 2007. The big employment gains have been almost entirely concentrated in the low-wage hospitality and retail sectors. If inequality is now greater in New York, the overall economic situation in other cities is, if anything, worse. New York at least has Wall Street, media and a constant infusion of wealth from the rest of world to keep its economy going and stave off the bond-holders. Yet even New York’s economy is underperforming its periphery. The city’s unemployment rate is 8.7% while the surrounding suburbs stand at 7.5%. This gap exists in almost all major metropolitan areas ; among the 51 largest metros the core unemployment rate is 8.8 percent compared to 7.1% in the suburbs. The gap is wider in other major cities. In the Chicago area, unemployment in the city is 2 percentage points higher than in the suburbs; in Los Angeles, the city unemployment rate is near 12%, three points higher than in suburbs. This, of course, all pales to Detroit where the city jobless rate stands at over 18% compared to 10% in the suburbs. Rather than “cure poverty” or export it to the suburbs, as is regularly claimed, cities retain a poverty rate twice as high as in the suburbs. And although hipsters and the global rich dominate media coverage, the vast majority of the population growth in urban cores over the past decade — upward of 80% — has come not from hipsters but the poor. These woes have been largely ignored by the press, but, as de Blasio’s primary victory shows, cannot be hidden forever. True, big investments aimed at attracting the “hip and cool” urban element have helped real estate speculators in selected districts, but has precious little positive impact on the neighborhoods where most urbanities reside. Unless addressed, the inequality in core cities suggests a similar lurch to the left could be seen in other cities. What is needed now is a new strategy that promotes the kind of broad-based economic growth that would make the urban “triumph” more than an empty one. 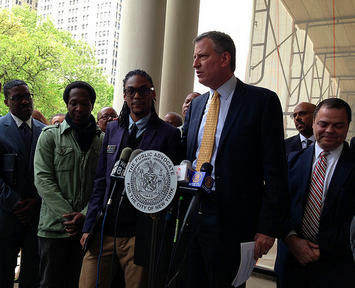 Photo courtesy of Bill de Blasio. Submitted by PhilBest on Fri, 09/20/2013 - 03:28. The kind of "triumph of the city" that Manhattan represents, is a triumph of rent-seekers, gougers and conspirators to defraud. It is the kind of "triumph" that the rest of the USA and the world would be better off without. I was shocked when reading Ed Glaeser's book, that he praised the fact that Manhattan incomes had risen while everyone else's had collapsed since 2007. This is Gordon Gecko morality. "People of the same trade seldom meet together, even for merriment and diversion, but the conversation ends in a conspiracy against the public". It is long overdue to return "finance" to the role of "handmaiden to industry". It was far more appropriate for Detroit to be the highest-income municipality in the USA, as Wolfsburg still is for Germany. Pity what happened to Detroit. Silicon Valley: also entirely appropriate, and the jewel in the spatial economics crown of true free market capitalism. Manhattan, on the other hand, is zero-sum rentier capitalism concentrated at one location. If the USA was like the UK, with one successful city based on high finance, and the rest all like Liverpool and Newcastle and Coventry, the US economy would be just as dismal as the UK. The USA's cities freedom to evolve whichever way the free market takes them, is the USA's primary strength. Submitted by lyle on Thu, 09/19/2013 - 18:38. Let me add another speculation to the port issue in NYC. Now that Norfolk has a good port and a lot less congestion to get out on railroads, has port traffic moved there from NYC also. (The Norfolk area also has better RR connections than NYC (Unless you talk the New Jersey side, which has far better RR connections that the NYC side, but of course port ops in NJ don't help the city other than thru the Port Authority.